What is the fabric interconnect? 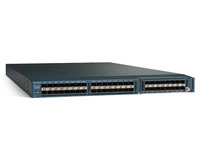 The interconnects provide a management domain, I/O consolidation in a high capacity loss-less fabric, and network connectivity for all attached devices. You might say that the interconnects are the communications core or backbone. They are currently available in two models… the 6100 series and 6200 series. I’ll review both. ● Low-latency (3.2 ms port-to-port latency). So that the beast that is the Fiber Interconnect management consolidation on a super high performance fabric. 3 models .. the 6120XP, 6140XP and the 6248UP. Next time I will discuss the Fabric extenders, the hardware component that links the Fabric Interconnect to the UCS 5108Blade Server Chassis or the rack mount servers.